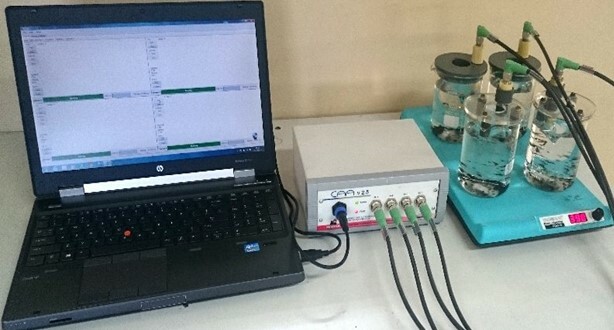 The CAA (Carbon Activity Analyser) is an automated instrument that provides simultaneous, independent measurements of four activated carbon samples with a turnaround time of one hour. The measurements are performed indirectly by measuring gold or iodine concentration in a solution over a time period during which a sample of carbon will adsorb dissolved gold or iodine. 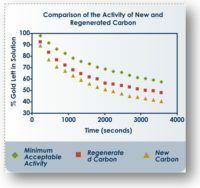 The measured drop in the gold or iodine concentration of the solution over this time, indicates the adsorbent activity of the carbon sample. Potassium aurous-can still be used periodically as a verification for the iodine tests. Below is a typical leaching circuit where the CAA is installed to monitor carbon activity. Click here to view the CAA brochure. Click here to read the published article at Heap Leach Mining Solutions 2016 in Lima, Peru.